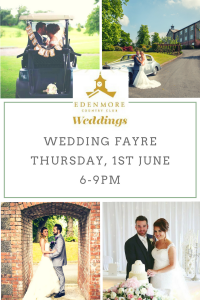 Only three weeks to go until our Wedding Fayre here at Edenmore Golf and Country Club. We are very excited to announce some of our Exhibitors! Elite Events NI, Debonair Groomswear, S.D. Kells, Jen Crowe Travel Counsellors, Chris Semple Photography, BF Salon Supplies, Entertainments Unlimited, The Bizz, I Do Wedding Cars NI, Helen Joy Sugarcraft, Bespoke Wedding & Occasion Cakes NI, Busybee Bespoke Wedding Stationery, Top Doves, Orchid Studio, Lilyanna Flowers. Come along and see our Newly Refurbished Wedding Suite with exclusive offers on the day. 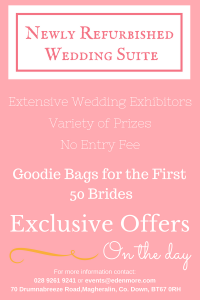 Goodie bags are available for the first 50 brides and there are many prizes to be won on the evening!